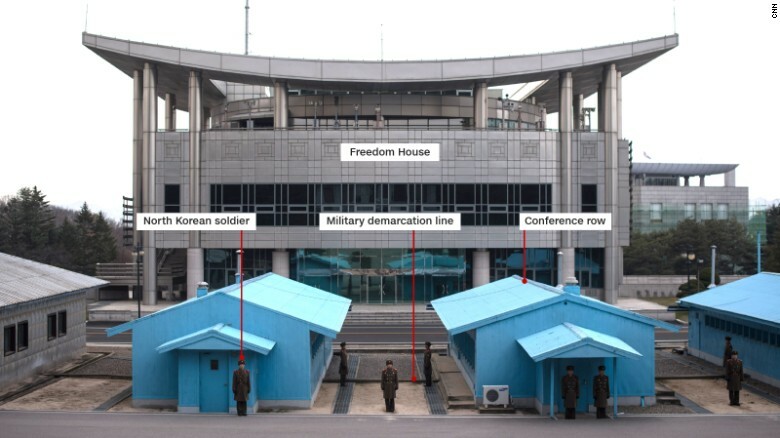 Seoul, South Korea (CNN) North and South Korea have removed all weapons and ammunition from the Joint Security Area (JSA), the notorious spot between the two Koreas where soldiers from North and South stand face to face, guns at the ready. The move is a highly symbolic one that South Korean President Moon Jae-in and North Korean leader Kim Jong Un hope will further reduce tensions between Seoul and Pyongyang. The JSA, which is also known as the Panmunjom truce village, has long been considered one of the most dangerous borders on the planet. Former US President Bill Clinton once called it the "scariest place on earth." Moon and Kim are out to change that. They held their first-ever meeting at the JSA -- during which each leader symbolically crossed the military demarcation line that runs through the village -- and vowed to turn the entire demilitarized zone (DMZ) that divides North and South Korea into what they called a "peace zone." To that end, the two Koreas and the United Nations Command that administers the southern part of the DMZ announced they have removed all mines from the region and withdrawn all guard posts, firearms and ammunition from the JSA as part of an agreement reached between Moon and Kim last month in Pyongyang, their third face-to-face meeting of the year. Since de-mining operations and excavations began at the beginning of October, 14 landmines, 187 explosives and the remains of two soldiers have been dug up, according to the South Korean Ministry of Defense. A DNA examination should determine the identity of the soldiers, but the excavation team believes them to be South Korean based on an ID tag found nearby, the Defense Ministry said. Trucks from the UN Command are seen inside the JSA. Both sides are next expected to withdraw what they called "unnecessary surveillance equipment" and "install any necessary surveillance equipment through consultations, and share related information with each other." The two sides will verify that they have disarmed in the JSA on Friday and Saturday. 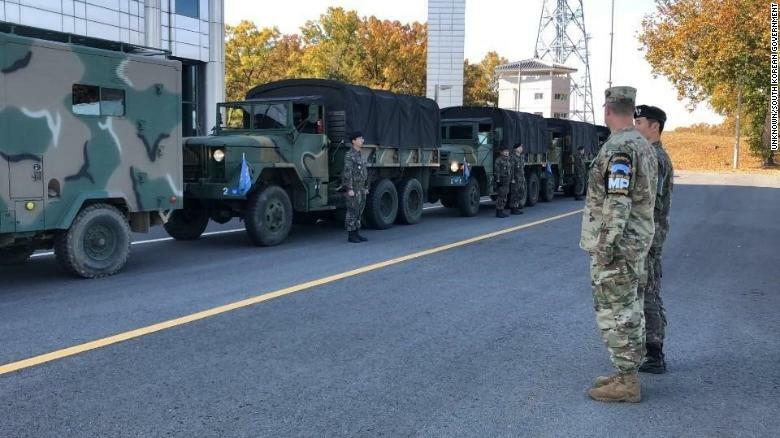 The area will now be administered by 70 unarmed personnel -- 35 from North Korea and another 35 from South Korea and the UN Command. The JSA is one of the last relics of the Cold War. Last year, a North Korean soldier was shot multiple times by his compatriots while darting to the south-administered portion of the DMZ in a defection attempt caught on camera. The changes in the JSA come after a year of detente between North Korea, its southern neighbor and its biggest adversary, the United States. Kim and US President Donald Trump pledged to form a new, peaceful relationship between their two countries during their history-making summit in Singapore, the first-ever meeting between the sitting leaders of the US and North Korea. The meeting represented a dramatic turn of events considering both leaders were threatening each other with nuclear war in 2017. Trump said another summit between the two leaders will happen after the US midterm elections in November.